This superb 2-CD release by the all powerful trio Motorhead was recorded on June 11, 2005 at the legendary Hammersmith Apollo. Total of twenty-three blistering tracks from the band's lengthy career. In fact, this show was to celebrate Motorhead's 30th anniversary since Lemmy left Hawkwind to form the ground-breaking metal ensemble. I have already played this title numerous times - especially disc two. A couple of lesser known songs pop up here and there - like "Shoot You In The Back" (off of the 'Ace of Spades' LP), "Dancing On Your Grave" (from 'Another Perfect Day' ) and another more recent tune, one that I simply don't remember "Whorehouse Blues" featuring some killer harmonica. As for the highlights of ' Better Motorhead Than Dead', there really are none for me, because every cut here holds my full attention. From the opener "Dr. Rock", "Love Me Like A Reptile", the vintage "Metropolis", their anthem-like "No Class", one of my all-time favorite metal tunes - "Just 'Cos You Got The Right", "Killed By Death", "Bomber" and the much appreciated encore of "Ace Of Spades" and "Overkill". Clocking in right at the 100 minute mark. 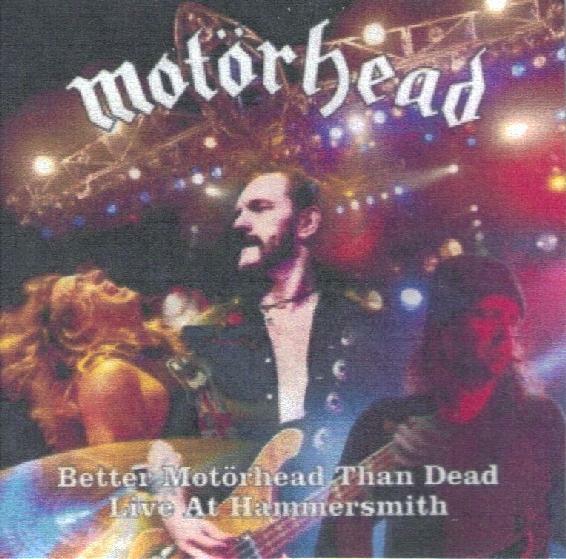 Even if you have every live release from Lemmy and crew, you're still going to want ' Better...'. Sound quality is great, but then again I'm a live album nut. Comes housed in a nicely assembled three-way digi-pack fold out, along with a handy sixteen-page full color CD booklet - sort of like a mini-program. Essential for any and all true fans of British metal.